The 2018 Consumer Electronics Show (CES) is in full swing and we’ve been browsing the exhibition to find and test cool products for you. On day 3 we saw one of the first Windows 10 on ARM devices, new Moto Mods, and Dell’s XPS 15 2-in-1, which sports the new Intel chip with AMD graphics. Lenovo’s Miix 630 essentially is a tablet with a detachable keyboard sleeve that doubles as a kickstand. And it’s one of the first ARM devices that runs Windows 10; Windows 10 S that is. ARM processors like the Miix 630’s Qualcomm Snapdragon 835 are more commonly found in Android smartphones. In the coming months, however, we’ll see more devices running the lightweight version of Windows 10. At first glance, it looks just like Windows 10 on any old computer. The key difference, however, is that, by default, you won’t be able to run desktop applications. With Windows 10 S, you’re restricted to apps available from the Windows 10 Store The Best Microsoft Store Apps for Windows 10 The Best Microsoft Store Apps for Windows 10 Microsoft Store apps for Windows 10 have come a long way. Here's our selection of the best Windows 10 apps, both free and paid. Read More . While you’ll have the option to upgrade to Windows 10 Pro for free and run desktop apps using an emulator, we can’t yet say how well that will work. Apart from the Snapdragon 835 ARM processor, which comes with LTE support, the Miix 630 features a 12.3″ WUXGA+ screen, 4GB or 8GB of RAM, and up to 256GB of storage. The camera is compatible with Windows Hello, meaning you’ll be able to log into the device using face recognition. The single USB-C port is a downside; you’ll have to choose between charging or attaching accessories. But the Miix 630 promises 20 hours of battery life and has a microSD slot. It also comes with a stylus, and writing on the tablet using the stylus was one thing that impressed us. The same can’t be said about the Dell devices we tested. The Lenovo Miix 630 2-in-1 running Windows 10 S will be available for $599-$799 in Q2 this year. The HP Envy x2 (pricing not yet available) and the Asus NovaGo TP370 ($599-$799) also run Windows 10 S on ARM, with the option to upgrade to Windows 10 Pro. Motorola, which is owned by Lenovo, has new mods for its Moto Z smartphone. We tried out the Lenovo Vital Moto Mod, a health tracker that slips onto your index finger and “measures your heart rate, respiratory rate, Pulse Ox [blood oxygen saturation], core body temperature, and for the first time, accurate systolic and diastolic blood pressure”. Lenovo is also hoping to add measuring of blood glucose levels, without having to prick your finger. The Vital Moto Mod will be out on April 1 for $395. We also tried the Livermorium Slider Keyboard, which came out in the winter. This Moto Mod was the 2016 Transform the Smartphone Challenge winner, developed in collaboration with Indiegogo. The full QWERTY keyboard slides out from under the phone and flips into a stand. It’s a neat feature, but really hard to actually type on; forget about touch typing. If you think you have a better idea for a Moto Mod, you have until February 6 to enter this year’s Transform the Smartphone Challenge and see your idea come to life. 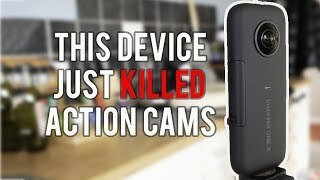 On day 2 (here’s CES 2018 day 1 coverage I Went to CES 2018 and It Was Quite Underwhelming I Went to CES 2018 and It Was Quite Underwhelming For the first time in its long history, MakeUseOf has made the journey to the Consumer Electronics Show (CES). We brought three of our finest (and me) along for the trip. Read More ), we toured Sony’s booth. 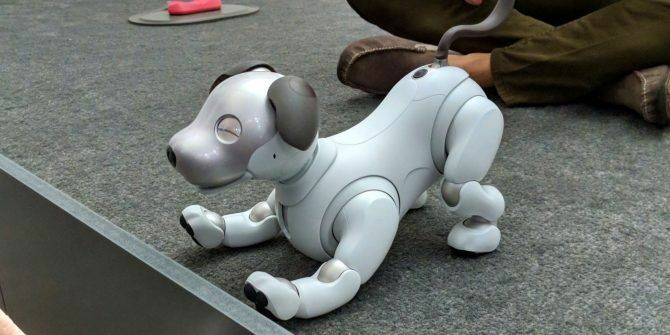 Among state-of-the-art TV screens, cameras, speakers, and headphones, the smart pet dog Aibo was the highlight of Sony’s booth. Unfortunately, it’s also one of the few items not yet available (outside of Japan). First launched in 1999 and discontinued in 2006, Sony’s robot dog Aibo is making a comeback this year. Powered by artificial intelligence and with cameras in his nose and tail, the new Aibo can map out your home, recognize family members, learn tricks, and develop a personality. Sensors in strategic locations like the head, back, and under the chin allow the AI puppy to react to touch and bond with humans. It picks up voice commands through a microphone and might eventually support smart home integration through Alexa or Google Home. When it needs to recharge or when nobody is home, Aibo will retire to its charging station. Aibo’s robotic skills come at a steep price. On top of the roughly $1,800 that Aibo will set you back, you’ll need to purchase a $26 monthly subscription to receive updates and make backups via LTE or Wi-Fi. For now, however, Aibo is only available in Japan. We were impressed with Aibo’s realistic behavior and little details like ear movements and its LCD eyes. Being a tech product, Aibo is also free of allergens, doesn’t need walks, and won’t make a mess in your house. But can it really love you? We find the idea of a robot pet that digitally “fakes” its attachment somewhat creepy. Meanwhile, pre-orders completely sold out in Japan. Would you care for a digital dog or cat? Noise-canceling headphones The 8 Best Noise-Canceling Headphones for Audiophiles The 8 Best Noise-Canceling Headphones for Audiophiles Looking for the best noise-canceling headphones? If you're an audiophile, these high-quality options are your best bets. Read More have come a long way. Formerly a tough choice between sound quality and effective noise reduction, many manufacturers now achieve both. We have previously covered Sony’s WH-1000XM2. These over-ear headphones offer supreme noise canceling, excellent sound quality, 30-hours of battery life, and to top it off they’re extremely comfortable to wear. At CES, we also tried out Sony’s wireless noise-canceling earbuds. The WF-SP700N are splash-proof and fit to be worn during sports. Though the battery life of three hours will somewhat limit your activities. But if you’re going to get a new smartphone without a headphone jack, it might be time to invest in compact wireless headphones to go with it. Sony’s latest model will be priced at $180, but you’ll have to wait a couple months before it comes out. Already available is the equally wireless and noise-canceling WF-1000X. All these models will be optimized for Google Assistant. Sony’s latest line of HDR 4K OLED TVs is suspiciously stylish. Viewed from the front, the A1E series lacks distractions like a bezel, stand, or speakers. All that’s left is a beautiful black slate that provides an immersive viewing experience. More than the superior visual design, however, the sound is what makes this TV outstanding. 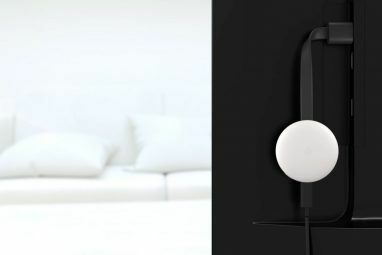 Instead of speakers, the Bravia OLED A1E TV contains four “actuators”, which sit at the back of the panel and vibrate the display to create sound. Sony’s Acoustic Surface technology can output audio from isolated parts of the screen, ideal for dialogue or moving sound sources. Paired with an integrated subwoofer, also tucked behind the screen, you can get amazing acoustics in the tiniest of spaces — provided you can fit a 55″, 65″, or 77″ screen. Sony already presented the A1E series at CES 2017. And by now you can actually buy it. The one Sony product that won’t be on the market for some time is an incredible 85″ 8K screen prototype. A 4K screen next to it pales in comparison. The 8K screen boasts 10,000 Nits (a unit used to measure brightness) making it the brightest television ever. 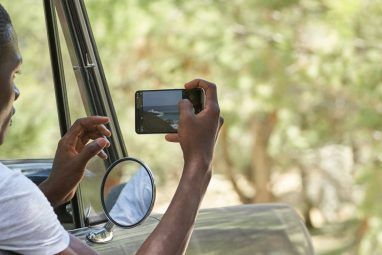 The screen is crystal clear with a vivid picture quality that makes you feel like you’re looking out a window. This is it for CES 2018. We’re wrapping up and getting ready to go home. To find more of our coverage, visit our YouTube channel or read about the superpowers you might get in 2018 5 Superpowers You Can Get at CES 2018: Drones, Instant Camera, and More 5 Superpowers You Can Get at CES 2018: Drones, Instant Camera, and More Some of the technologies at CES 2018 can give you superpowers. Here are three of the best! Read More . Which products you’re most looking forward to in 2018? Let us know and we’ll try to review them for you, complete with a Giveaway. Explore more about: 4K, CES, HDR, Headphones, Pets, Robotics, Touchscreen, Windows 10 S.